Roman artefacts have been discovered at the site of Delapre Abbey in Northampton. As part of the building’s Heritage Lottery funded restoration, groundwork to install new gas pipes uncovered a series of finds which reveal the site dates back further then previously thought. Iain Soden, of Iain Soden Heritage Services, the on-site archaeologist discovered a concentration of high-quality pottery, a glass vessel, and a copper alloy pin, all most likely from the late Roman period. He said: “The discovery was a surprise, given that we’re in the lee of a medieval nunnery. Roman Delapre was not our first consideration. “There are some really nice pieces here and, while there’s going to be some reconstruction necessary, they will be of value in telling the wider story of this site. Previously it was thought the medieval abbey, built in the twelfth century, was the earliest activity on the site. Iain will now work to clean and piece together the sherds of pottery, and an archaeological illustrator will recreate what they looked like. One of the most interesting and intriguing finds was a small glass phial which appears intact, and will be the subject of further study, along with the other relics. 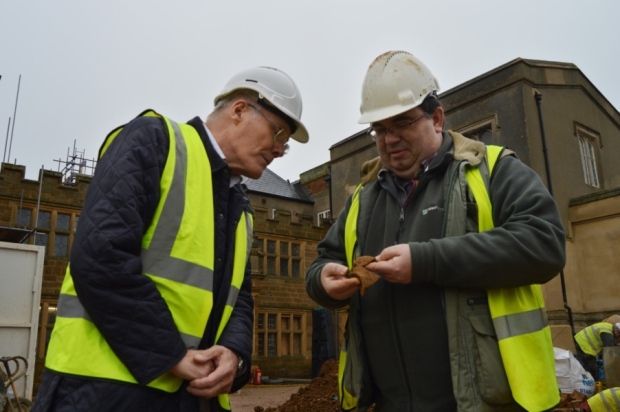 Northampton Borough Council is working with the Delapre Abbey Preservation Trust (DAPT) on the abbey restoration, being carried out by specialist contractors Woodhead Heritage. The work is expected to be complete this summer. Councillor Tim Hadland, the council’s cabinet member for regeneration, enterprise and planning, said: “This find is a total bolt from the blue. There’s been no previous indication of Roman activity on this site, and it will completely transform the way we view Delapre. DAPT operations director, Rachael Boyd, said: “It is a just reward for all the painstaking restoration work, and it adds another exciting strand to Delapre’s story.